Assemble the wooden pieces to make a self-propelled horse. Before the Age of Steam took over the world, drastically changing every sphere of human activity, the only reliable transport available to travellers had been strong and fast horses. 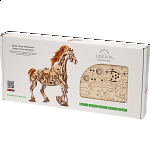 Ugears looks away from high end technologies and ultrahigh-speed to appreciate the time of travelling by horse-back with a model joining nature and mechanics - the Bionic Horse.The absolutely unique mechanism of the model that makes your Horse a real quadruped is a brand new innovation developed by Ugears and presented for you to test for the first time ever. The designers paid special attention to the anatomy of the animal's legs to make sure that all the joints and movements closely resemble those of a real horse. 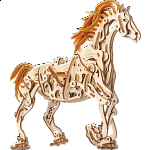 The mane and tail of the horse that are meant to flow in the wind are made of flexible rubber bands. When moving, the mechanoid shakes its head swaying its soft rubber mane.